Let the holiday season begin! Thanksgiving ushers in six weeks of busyness as we reunite with family and friends for dinners, parties, and holidays such as Hanukkah, Christmas and New Year’s Eve. This is a time of gift giving. 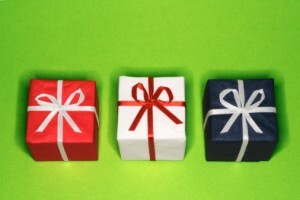 In addition to daily business and family activities our minds find time to weigh questions such as “What would my children enjoy?” and “When should I order the turkey?” and, of course, “How can I give to all the people I love without going broke?”In the midst of all this holiday activity comes the busy season for nonprofit fundraising. Some organizations and institutions encourage us to give before the year-end to take advantage of tax benefits, while others offer opportunities to remember those who are less fortunate. Still others invite us to imagine new expressions and manifestations of the arts, leadership, education, and science. If you can take a moment to escape the hustle and bustle of the season you may find a way to combine celebrations, gift giving and support for nonprofits that are important to you and your family. You can put the busyness of the season in perspective by spending the afternoon with your children volunteering at a local hospital, food bank, senior center, or veterans home. When considering what to give, consider underwriting a child’s pre-K education by giving to a program that had their funds cut this year. You’ll be giving a gift that will make an impact for a lifetime. You can make that gift in honor of a family member. Other ideas include purchasing gloves or socks in bulk to give to people who are homeless in your community. Spend an afternoon making tasty sandwiches and share them with people who are hungry. Talk with your faith leader, college representative or another trusted person “in-the-know” to find out which out-of-state (or out-of-country!) college students need a home for the holidays and open your home and heart. If your neighbor is in need, consider purchasing a gift card she can use at a local grocery store. This is an ideal time for a gift to the food bank. Gifts to scholarship funds are easily made on-line and are more important than ever as so many students are losing access to Parents PLUS loans. Give to help those half-way around the world by supporting victims of the typhoon in the Philippines. If you are thinking of purchasing a pet for your child, consider adopting one from your local nonprofit animal rescue or ASPCA. Many nonprofits publish beautiful calendars – consider giving one as a gift. Purchase your Christmas tree from a nonprofit and holiday cards from UNICEF. Most importantly, sit down as a family and share the gratitude you experience. Then find a way to give in ways that speak to your hearts. This entry was posted in FUNdraising Good Times and tagged Christmas and holiday season, gift giving, holiday gifts, nonprofit, Nonprofit organization. Bookmark the permalink.